Don't forget to come along to the Sherwood Christmas Light switch on tomorrow evening (Wednesday 28th November) . The beat team will be there and helping to get everyone into the Christmas Spirit! The evening will be starting with mince pies and Christmas songs with Seely Primary School at 4pm. 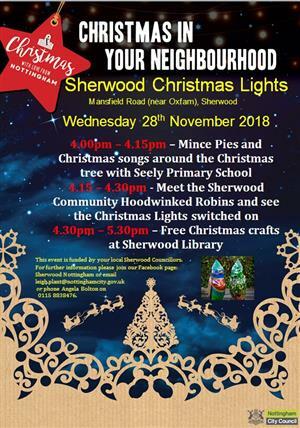 You can come and meet the Sherwood Community Hoodwinked Robins & take the opportunity to have a selfie or two with them! Join in the count down to the light being switched on.